I like new music and I like talking about music. But that’s not that interesting an article to write or read, so instead I’ll just review some (relatively) new music and discuss it here. Measuring in at 10 tracks and just a hint over 40 minutes, Yeezus is Kanye West’s shortest album yet; a coiled, mean explosion of sound and spite. And I mean that in the best possible way. Off the top, it is important to note that this is a sonically different endeavor for West. Like 808’s and Heartbreaks before it, the rapper pushes the entire record in a new direction. Unlike the auto-tune 808’s the direction here is atonal, rapid, and harsh. Of the tracks, only “Blood on the Leaves” with its Nina Simone “Strange Fruit” sample, recalls the West of his first three records. This is not to say that West fans will not like this record. I love those first three albums and I’d still recommend this one. Like 808’s and, to a lesser extent, 2010’s My Beautiful Dark Twisted Fantasy, this is a record that probably should be listened to a few times before issuing an opinion on it. It is so different that it takes a little while to get past that and start to notice motifs, themes, transitions, and even, at points, the lyrics. For me, 808’s never fully rewarded those efforts—it was good, but not great—while Fantasy paid dividends almost immediately. I’d say that Yeezus requires the work of 808’s but gives the payoff of Fantasy, if that makes any kind of sense at all. I’d place the “Black Skinhead”/ “I am a God’/ “New Slaves” sound sequence up against any three other song sequences on his other albums with utter confidence. Those three provide the sun around which the rest of the record revolves. They are the decoder ring, if you will, for the themes on the rest of the disc. Crack them and the album falls into place. For the misogyny charge, I don’t know. He does say some disturbing things, undoubtedly. And his male gaze is strong here, as strong as ever perhaps. I, however, don’t buy that male gaze is, in and of itself, always misogynistic and the record plays more misanthropic (hatred of everybody, not just ladies) than anything else. What I will say for sure is that they are themes worth discussing and parsing over. The record doesn’t feel…easy, I guess I’d say, in its anger. This is not dumb cruelty, sprayed about for shock value or born of violent ignorance. There is stuff to unpack here, if you will, and I think the record earns that much from the listener. The race relations is even thornier to take on, especially given my skin tone—very white—and my upbringing—very suburban middle class. That said, here we go anyway. “Slave” is obviously a loaded term, but, like many loaded terms, those whose lives or bloodlines have been touched by said word have a bit more freedom to wield it, in my opinion. Part of people’s problem with it seems to be they find the idea that West could consider himself a new slave a bit ridiculous given his wealth, fame, power, and so on. There is, however, precedence for black artists and athletes framing their experience in this way. Prince wrote it on his cheek as a protest against his then record label, Adrian Petersen used it in 2011 in reference to the demands owners were making of the athletes during the brief lockout. Hell, at least two books invoked the premise in regards to sports 40 Million Dollar Slaves and The Slave Side of Sunday. While indentured servitude is probably closer to what they are describing, it does not have the same ring to it, does it? Thus, I think West’s use of slave is more than fair game to describe a state of being for Black Americans where they either shunned and exploited (the poor side) or “invited in” and exploited (the rich side). I don’t feel comfortable saying it is or is not like that for West and others in America but I think it is a compelling thesis worth expressing, especially given how vividly he breaks it down and connects it to his mother’s experiences during the time of segregation. It might be too much, but then, this is a Kanye West record, isn’t it? Excess and hyperbole are part of the deal and, often, part of the appeal. One theory I’ve read regarding this record is that it is a last gasp, a purging for West, to dump all of this out of system before he becomes a father and, presumably, a full-fledged adult. I remain unconvinced on that perspective. To me, the record sounds more like defiance. West isn’t the guy looking for one last fling before he settles down. He’s the guy who’s sick of his friends hassling him about the settling down and goes out to prove he’s never going to change. He’s going to rage against whatever people think he should sacrifice to be a dad and he’s going farther than he would normally to reinforce it. You can hear it in as he gasps and struggles at the end of “I am a God,” refusing to yield. He’s not settling down, he’s breaking out. 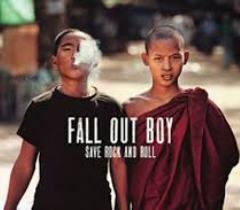 Save Rock and Roll explodes from the moment the album begins, letting listeners know right away that Fall Out Boy feels they have more than a little to prove/remind people of. On the first two tracks, “The Phoenix” and “My Songs Know What You Did in the Dark (Light Em Up),” start so high on the horse the album has nearly no room to go higher. They are big, bombastic, and intoxicating; as loud and arena filling as anything on any of the previous four FOB albums. And, to the record’s credit, it doesn’t try to top them. Its intentions announced, they take their foot off the gas a bit. The record is still big, start to finish, but it also breathes. There’s ache there and struggle. This is a band that, for all intents and purposes, broke up and then found that, on their own, they hadn’t really figured out things either. You can hear some of the bruising and you can feel them try to push it away and climb above it. For FOB fans, rest assured, the band still wants you onboard. The odd lyrical metaphors are still there; the band is, by turns, “jack o’lanterns in July” and “like young volcanoes,” both great turns of phrase that don’t seem to mean anything, really. Stump’s voice is as strong and distinctive as ever and the instrumental work is different while remaining recognizably Fall Out Boy. The band pulls in some odd collaborators too with Elton John guesting on the title track and providing his voice for little more than 15 seconds of the song and Courtney Love sings on “Rat a Tat” an ode to appreciating your time on Earth, oddly enough. Actually, that is worth pointing out. Like no other FOB record, Save is shot through with mortality. It rarely takes center stage, but the spectre of eventual demise dances at the margins and pushes the record along. While no fan of death (we’re just not that cool with one another) I appreciate the way they lace it through and allow it to provide a sort of scaffolding to the album. To paraphrase Rolling Stone’s review, rock doesn’t need Fall Out Boy, but it is nice to have them back anyway.